Halloween has always been my favorite holiday. When I was a child, it was all about the costume. I could be anyone or anything I wanted to be for one night. The results were often less satisfactory than the desire, but the bag full of candy made everything all better. We’d carry our pillow cases from door to door, not bothering or even caring whose house we were knocking at. We just tried to visit as many houses as possible. As I grew older and trick-or-treating was no longer an option, I turned to the more sordid aspects of the holiday. Mischief. I don’t see this as much in New England as I did in the Midwest, but one of our favorite things to do during the Halloween season was tee-peeing. I’d save my allowance for a month and then buy cases of toilet paper with it. Most of the time we went in groups. We’d pick someone who had wronged us in some fashion, and then we’d slip into their yards in the wee hours of the morning and would throw toilet paper into their trees. I can remember the rush of adrenaline as I hid at the edge of the property, trying to gather my courage. There was a very big chance that we would get caught. If the person chose to, they could have called the police and had us charged with vandalism. One of us would give the signal, and we’d rush into the yard, tossing the rolls into the trees. The goal was to toss the roll as high as possible, leaving a long white streamer behind. It took a bit of practice, but I eventually got the hang of it. We’d continue until we either ran out of TP or we risked getting caught, then we’d slip away, high fiving one another for a job well done. When I was thirteen-years-old, my family moved to a neighborhood filled with boys. I quickly developed a love-hate relationship with them. Actually, it was more of a hate-hate relationship, more than anything. A family of three boys lived next door to me, with another scattering of boys in other houses in the neighborhood. Most of the time they were very mean to me, being the only girl in the neighborhood. They’d set up a game of baseball in the front yard, but would never let me play. They’d throw firecrackers at my feet if I had the audacity to step foot onto their home turf. I wasn’t allowed in their club house, a small building they built at the border of our two properties that was used as their main hang out. As Halloween approached, I started getting evil ideas. I stockpiled toilet paper, hiding it in my room so my mother wouldn’t see it. While she wasn’t necessarily friends with the neighbors, she wouldn’t have approved of my act of vengeance. Several nights before Halloween, I set my alarm for 2am, and then slipped from my bedroom window, armed with toilet paper. The windows were all dark in the house next door. Not a soul was in sight. I sprang from my hiding place and spent the better part of a half hour, practicing my toilet paper throwing abilities. By the time I was finished, you could barely see the tree under the white streamers. I did my best to hide my smile as the boys got onto the school bus the next morning, but it probably wasn’t even necessary. They knew who did it. I spent an enjoyable evening watching them grudgingly attempt to pull the paper from the trees. Every once in a while, they’d cast angry glances at the front of my house, where I sat watching. It wouldn’t be something that I’d enjoy for long, though. All six of them returned the favor the following night. They pulled out all the stops. Instead of just papering our trees, they also used soap to draw profane pictures on all of our windows, and they dumped an entire bag of corn kernels into our yard, knowing they’d sprout corn the following spring. The biggest problem with this was their timing. My mother had signed our house up to be on a Tour of Local Homes. It was going to take place that weekend. When she looked out the window at the flurry of toilet paper hanging from the trees, she wasn’t very happy. 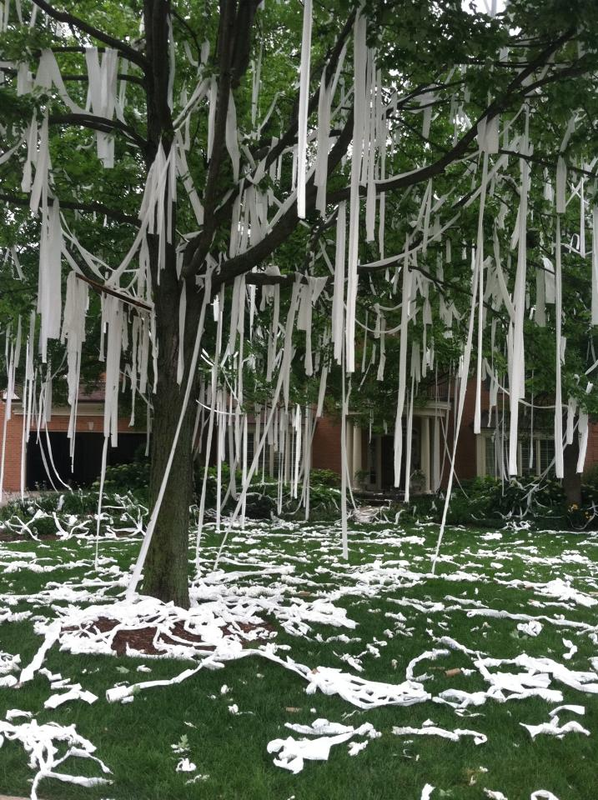 It would be the neighbor boys’ turn to laugh at me as I was pulling toilet paper from the trees. One of the younger children in the neighborhood confided in me that they planned to do it again the following evening. Knowing how upset my mother would be, I jumped into action. I waited until I knew they were all home and began setting up a ruse. I had a length of twine and began running it from tree to tree in the front yard, covering the entire perimeter of the yard. I’d look up on occasion and catch a curtain fall close. I’d just smile, knowing my plan was working so far. They were curious about what I was doing. I spent an hour with the twine, and then followed it up by bringing a car battery to the front yard. It was just an old battery that my step-father had kicking around in the garage, but the neighborhood boys didn’t know this. The last phase of my plan was to tell one of the younger children that I’d set up an electrified perimeter fence. I told her to be careful if she happened to come into my yard because I wasn’t sure what it would do to someone. “It might even electrocute them,” I said, managing to keep a straight face. That night was my night for fun. I sat in the living room, watching out the window. It took a few hours, but they began to show up, armed with toilet paper. They walked cautiously around the property, looking at the twine perimeter fence. I could see them pushing each other, trying to get one of them to test it. In the end, they just gave up and walked home. I could have been extra evil and repaid the favor to them later in the night, by tee-peeing their yard again, but I didn’t. I’d pulled my greatest prank yet. Just seeing them walk away disappointed, was good enough for me. Sometimes, I think back to those memories with a fondness I can’t duplicate. Those boys are long grown. I heard that one of them died when he was barely in his twenties. The others just disappeared into the wind. In my heart though, they are still twelve and thirteen, and I am the same, and we are waiting for another chance to get even with one another. The dogs knew the house was haunted long before the owners did. Wendy and Nina, two tiny white Maltese dogs, would stand at the bottom of the grand staircase at the Victorian mansion and growl. Edwin Gonazalez and Lillian Otero had purchased the gothic looking Second Empire Victorian mansion, also known as the S.K. Pierce House, months earlier and were eager to move into their beautiful home. Reports that it was haunted didn’t bother them, because they weren’t believers. This would change in a matter of months, but the dogs were one of the first indicators. “They would wake up in the middle of the night, growling at the hallway, absolutely fixated on something I couldn’t see,” Edwin said. 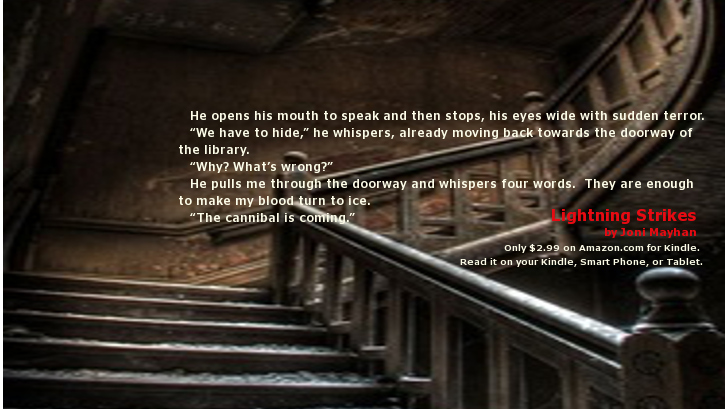 He’d open his eyes to scan the dark hallway, afraid of what he might find. On several occasions, he saw a black shadow mass move across the doorway, blocking out the lights in the hallway. Can our pets actually see ghosts? Christina Tregger Achilles, co-founder of New England Paranormal Observation Science Technology (NE POST), had a similar experience at the S.K. Pierce House with her dog Sierra, a tiny fawn-colored pug. “Our friend Ben caught her on camera, reacting to things that were happening upstairs. She would be sleeping soundly, then would wake up and stare at the third floor stairs just before something would bang or bump,” she said after touring the mansion with co-founder, Chris Cox. “She continues to sense things. I catch her watching something as if she’s watching a tennis match,” she added. Are they seeing or hearing something we can’t? While there aren’t any hard facts to support the concept that dogs and cats can see ghosts, it has been documented that they do have much keener senses, making one wonder what they are capable of picking up on. While it’s not proof, their vision is very different from ours. It is geared towards movement to assist them in hunting, also allowing them to see better in low light situations. Cats also have a better grasp on colors at the red end of the spectrum, allowing them to differentiate between blues and violets better than we can. Also consider the use of full spectrum cameras on paranormal investigations. Researchers using these cameras, which photograph a broader array of the color spectrum than what can be seen with human eyes, often capture strange shapes and anomalies in the photos. Is this what our pets are seeing? And they can also hear better than we can, lending more truth to the concept. A dog can detect sounds that are well beyond the spectrum of human hearing. While humans typically hear sounds from 12Hz to 20,000 Hz, a dog can hear nearly four times greater, in the 40Hz to 60,000 Hz range. If you don’t believe this, just blow on a dog whistle or download an app for your smart phone and test it yourself. When I tried this, I was dismayed to discover that I could only hear up to 12,000 Hz. But when I pressed the button at the 20,000 Hz range, every pet in my house sat up to look at me. Is it possible that spirit communication transpires in a frequency that is either above or below the range we can hear? It has long been speculated that ghostly phenomena exists at a different plane of existence. Researchers collecting EVP’s (Electronic Voice Phenomena) will often record spirit responses on digital recorders that cannot be heard by human ears at the time they are recorded. A true EVP response will not be heard at the time the question is asked, but will be captured on a digital recorder, suggesting that spirit communication is conducted at a higher or lower range of the audible spectrum, something we as humans cannot hear, but our pets might be able to. People have been reporting this occurrence for years. Nick Mantello, co-founder of the Berkshire Paranormal team, is one of the caretakers for The Houghton Mansion. Located in North Adams, Massachusetts, the three-story mansion has been featured on many paranormal shows, such as the SciFi Channel’s Ghost Hunters, as well as the Travel Channel’s Ghost Adventures. When he visits the mansion for routine visits, he often brings his dog Kronk with him. Kronk often stares at the corner in the Masonic Temple, a building that is still used by Freemasons of the Layfayete-Greylock Lodge. Kronk often stares and then barks in areas of the mansion where paranormal activity has been captured. One of his least favorite areas is a corner of the Lodge in the Masonic Temple. “I’ve told people this story about the corner of the Lodge. The dog just don’t like it,” he said. He captured Kronk’s reaction on the video link below. The stories are endless. 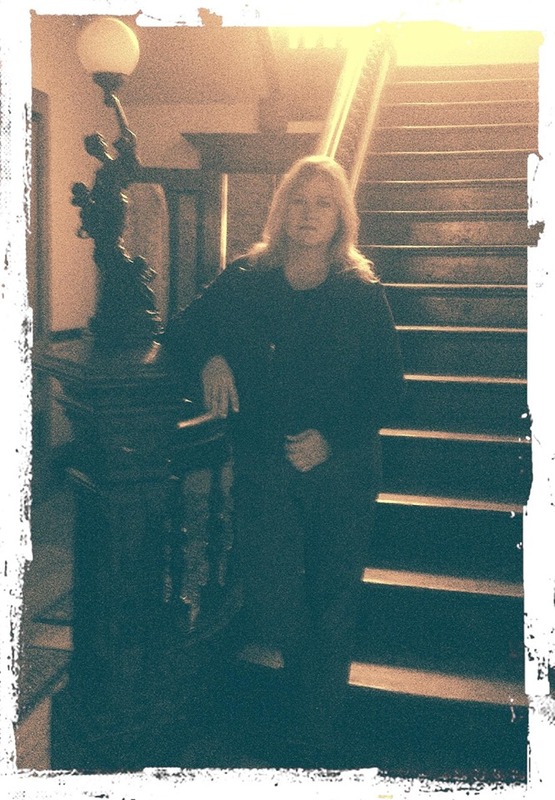 Sandra Chase, an avid paranormal enthusiast had an experience she recently shared with me. Her husband passed away in 2007. He was fond of playing computer games and would often pet their dog while he was playing. 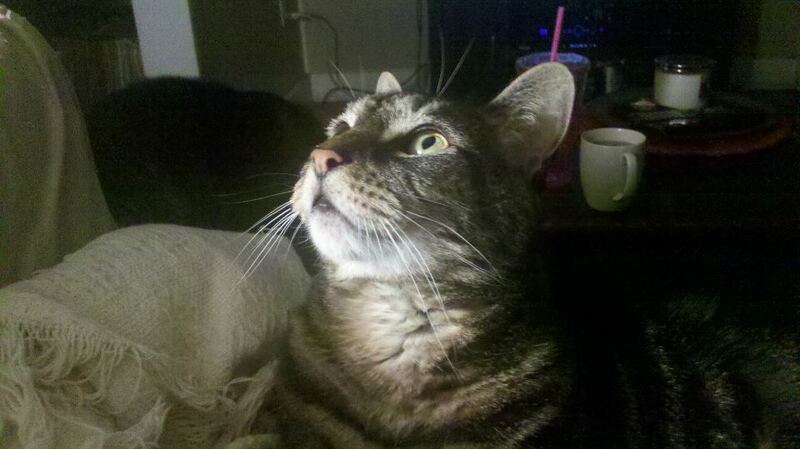 “About three months after he passed, the dogs and I were in the living room. Rags was sleeping on the rug. All of a sudden, she got up and went over to the computer chair, put her head under the arm, and started wagging her tail,” she said. Is this proof of paranormal activity? Unfortunately it’s not, but it’s something pet owners will continue to pay attention to. Until dogs and cats are able to tell us what they’re seeing, we’ll always be left guessing. Some of us don’t need proof to understand what is happening. “They just know,” Lillian Ortero said. I have a tendency to agree with her. I should have listened to the signs. Someone didn’t want me to go to the Haunted Victorian Mansion. Throughout my life, I’ve come to realize that very little happens by accident. Nearly every situation, ever conversation, every chance meeting leads you to another place in your life. If you look back and track these things, they become very apparent, almost like dominoes tipping over onto one another. I’ve been strangely drawn to the Victorian since the first time I saw it. I knew that a house in Gardner had been on the paranormal television show, Ghost Hunters, but since I seldom visited the town, I didn’t know where it was. Then as if by chance, I started dating a local guy who showed me a shortcut to Staples. It was a shortcut that led me directly past the huge Second Empire Victorian Mansion. The first time I saw it, my breath was taken away. That’s the house, I thought to myself with a sense of awe. I wanted more in an instant. I wanted to walk inside of it and see the beautiful architecture. I wanted to know if it was really haunted. I wanted to know why it was for sale. I kept my eye on it for several years, making excuses to drive past. When fate intervened again, I had an opportunity to investigate there through a public ghost hunt. I was mesmerized by what I saw. The house was even more grandiose on the inside than I expected, after seeing the rapidly deteriorating exterior. The rooms inside were garnished with elaborate hand-carved woodwork. Every door was a work of art; every doorknob was a slice of history. I tried to imagine how many people had put their hand where my hand was, how many lives passed through these doors, and how many of them never left. Over the course of a year, I would investigate there three more times. When I overheard the owners talking about a Halloween Haunted House tour, I quickly volunteered to help. I spent several evenings at the mansion, helping to decorate, and then fought a surprise October blizzard to be there for the seven hour tour. For the next few years, I would find ways to be there, whether it was to help with investigations and tours, or to help the caretaker shovel snow, or walk through periodically during the long winters when the mansion was closed. In all honesty, it became an obsession to me. Being intuitive, I had a deeper connection with the spirits at the house than was probably healthy. I felt bad for them, having to go through investigation after investigation, and would have conversations with invisible people, hopefully comforting them with the thought that the funds raised were going into the house repairs. I began helping with fundraising events and connected the owners to a friend of mine who did websites, I found a contractor who’d donate his time to do some of the repairs. 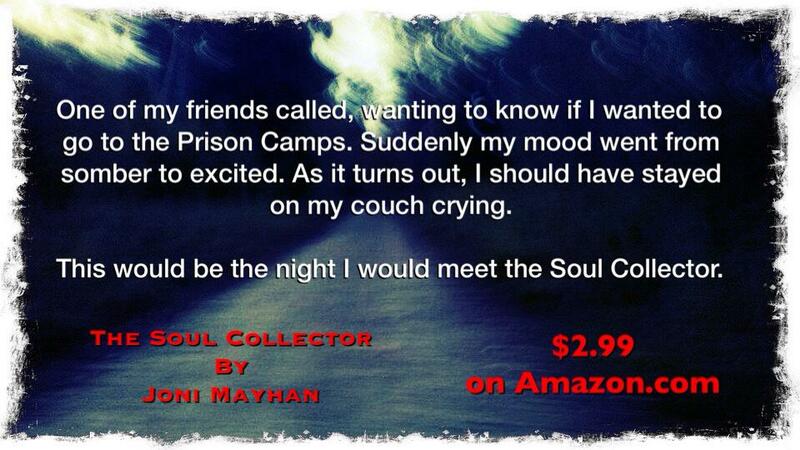 I blogged about my experiences there, even including a chapter in my book, The Soul Collector. I defended them when they were under attack from several members of the paranormal world. I never turned down a chance to be there, even after I moved over an hour away. My friend, Sandy, saw it and worried about me. “You need to make a break from that house. It has an unnatural hold on you,” she told me. I didn’t disagree, but I was like an addict, needing a fix. “You are probably right,” I’d tell her, and then make plans to be there the following weekend. Even after my friend MJ had a strange dream about me, warning of future trouble, I still didn’t heed the warnings. She saw me working in the nursery, while a ghost in the room told her that I wasn’t allowed to leave, that I belonged to the house now. Most people would have listened to something as potentially prophetic as that, but not me. One October afternoon, I’d promised MJ that I’d bring her to see the house. She’d always wanted to see the inside, but couldn’t manage the investigations with small children at home. By this time, I was writing a book for the owners about their experiences, so I wanted to stop by for another interview. The day started fine, but the closer I got to the event, things started happening to prevent me from arriving. First I started getting a migraine. When I staved it off with massive amounts of migraine relief, the next thing happened: my GPS didn’t recognize her address. When I worked around that, I inadvertently drove for ten minutes the wrong way on Route 2, before realizing my mistake. And then, I didn’t have a key and the owner was going to be late. And through the entire afternoon, my ears were ringing, ringing, ringing. Being clairaudient, I can hear ghosts and spirits. A ghost makes a sound that immolates static or white noise. A spirit, someone who has crossed over into the white light, has a pure high pitch. One bothers me and the other comforts me. This tone was high-pitched, making me wonder who was with me. Was it a spirit guide? A relative who had passed on? I didn’t know, but it gave me the impression that it wasn’t happy with me. I’ve been told that we all have spirit guides or guardian angels who look after us. I could imagine mine pretty clearly. Protecting me would be a job nobody would want considering the places I always seemed to visit. I could imagine them with their heads in their hands, saying, “not again!” This one wasn’t any different. When we finally arrived at the Victorian, everything grew silent. The ringing grew quiet and I completely forgot about it. We had an enjoyable evening sitting around the kitchen table talking with the owner and friends of the Victorian. A group had booked the mansion for an investigation, so we tried to stay out of their way out of respect for their evidence, knowing that when someone is walking around, it causes contamination on the audio and video recordings. MJ and I waited until they broke for dinner and made a mad dash to the master bedroom for an evp session. We spent about fifteen minutes there, speaking almost freely to several ghosts in the room, before moving to the third floor Billiards Room. I made the mistake of calling the male ghost forward to talk. He didn’t seem very happy, responding with a derogatory comment. As I left that night, I could hear the sounds of several tones in the car with me. None of them were spirits. They were all ghosts. It was enough to make my skin crawl. “You need to go back to where you came from,” I demanded several times. Being appropriately cautious, I’d taken the normal precautions of burning sage, saying prayers, and carrying my special totems with me to help keep me protected. None if them worked though. I had a car full. Since moving, I was pleased to have my bedroom all to myself. Gone were the constant feelings of being watched and everything else that goes along with a haunting. But over the course of the next few days, I’d see my sunny bedroom become dark, as though the light were being sucked away into a vacuum. The ghost tones would come and go, causing my cats to watch invisible shapes move around the room. On Wednesday night, as I was taking a bath, one of my kittens yelped from outside the door. When I found him cowering on the stairs, I carried him to my room, where he refused to leave my side. The other cats kept coming up to sniff him, as though something were wrong. Seldom do I turn on ghost hunting equipment in my own house, but I needed to know if it was paranormal or not. “What happened to my cat?” I asked the Ovilus. “Sqeeze” it said. I got chills from head to toe. I woke the next morning with the feeling of someone lingering very close. The sound of ear ringing was so loud, I couldn’t hear anything else. Suddenly, I felt something grab both sides of my head and squeeze. The sensation wasn’t painful, but it was alarming. I jumped up and told it to stop. “Just leave me alone!” I told it, wanting to get another few minutes of sleep. It was bad enough that the cats were frequently waking me up before my alarm, wanting breakfast, but now ghosts? The reprieve only lasted a few minutes before it was repeated. After I’d had my coffee, I knew I needed to do something. I tried to convince them to cross over into the light. I’ve had success in doing this in the past, but this time they weren’t budging. It was time to call in the reinforcements. I put a message out to Barbara Williams. 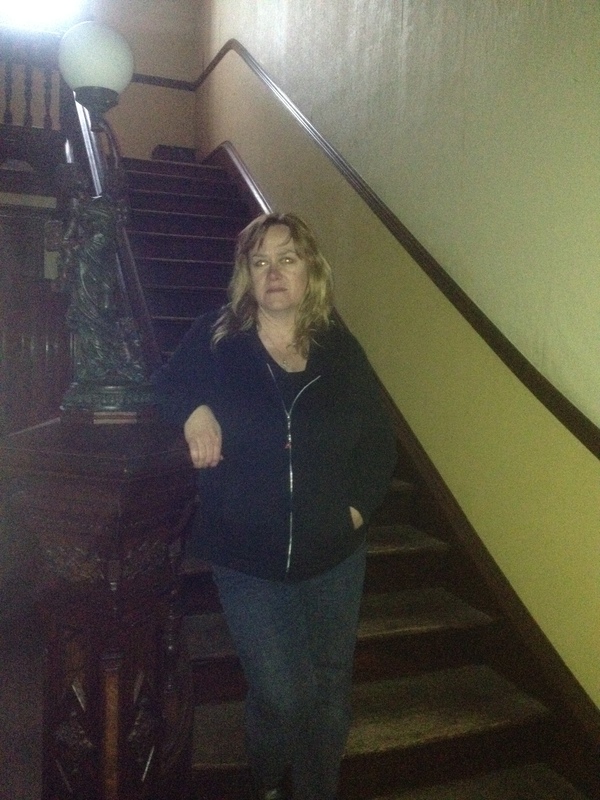 Barbara is a psychic medium who lives in Maine and is director of New England GHOST’s Maine branch. She’s helped me many times before and she’s someone I trust fully. She did something very interesting, and if I hadn’t witnessed it myself, I probably wouldn’t have believed it. She set up a remote cross-over session. She connected with two other mediums, as well as myself, and set a specific time to help the ghosts move on. As the time grew near, I could feel the ghosts moving closer to me. I don’t always get psychic impressions of what’s around me. Usually I just hear the tones and try to figure it out by the register of the pitch, but this time it was very clear to me. I had a woman, a man, and a child. There were also two others there as well, souls that had been with the house I’d moved to. I stood in the middle of my room, feeling foolish as I usually do when talking to invisible people, and closed my eyes. “It’s time,” I told them. “You need to move on.” I told them about the white light and how it is a place of peace and serenity. Why stay here in a world where you don’t belong? Why be miserable when you can find the harmony and tranquility you deserve? After several minutes I could feel them cross. I was a little troubled though. I could still hear the sound of one lingering. I just let it go for the moment. The female had stayed behind. I saw her very clearly in my mind. She was in her early forties, with long dark hair. She wasn’t thin, but she wasn’t heavy. She carried the weight of the world in her eyes. If she were alive, we could have probably been great friends. She didn’t seem threatening. I’ve been around malevolent entities before, so I know how that feels, and she wasn’t giving me any of the same bad vibes. I felt like she just wasn’t ready. She seemed sad. Maybe she had some unsolved issues she needed to attend to. I went back to my Ovilus. “What do you want to tell me?” I asked. The Ovilus spoke almost instantly. “Cancer,” it said. It then spit out several other words that were seemingly random and didn’t make any sense, but then repeated the word “cancer” again two more times. After a few days, I contacted Barbara again and told her I still had one left that I needed help with. Barbara promised to help me and moments later I heard the tone begin to fade. After several seconds it was gone for good. I reached out to Barbara again, hoping to gain more insight. What she told me was very thought provoking. Being a very talented medium, Barbara was able to talk with the woman. She told her that she died of cancer, but wanted to stick around to watch over her family. She’d found me by happenstance, following me home hoping for help. No one is sure how she ended up at the Victorian, since she is more contemporary, and she didn’t seem to know the answer herself. Maybe she followed another intuitive person, hoping for help, and ended up there by accident. It’s something we’ll never know for certain. What we do know is that she finally crossed after being reassured that she could come back later to watch over her family. It was good to know. My new house is no longer haunted and my nights are my own again. I don’t understand why this is all happening to me, but it’s helping me learn so much more about this mysterious amazing world we live in. Something didn’t want me to go to the Haunted Victorian Mansion on Saturday. The first indication came at noon. I was supposed to leave at two o’clock to pick up my friend Mary-Jane, aka MJ, who’d never been to the Victorian before. She was aptly excited after hearing about all my adventures there, which I can’t blame her for. The house has a way of pulling us all in. I’d been bustling around the house catching up on housework, putting things away that I’d hastily stowed in random places during the hurried pace of the week. I swept, mopped, changed litter boxes, and was starting to gather my ghost hunting gear, when a migraine headache came out of nowhere. Usually they come on slow, building ever so slightly until my head feels like it’s caught in a vice grip, but this one was instant. It was as though someone latched onto my head, held me by the temples and squeezed with all his might. Unfortunately for me, I’ve been down the migraine road far too many times. I began getting them at the young age of eight, resulting in years of cat scans, MRIs, X-rays, and other procedures of the seventies and eighties. I have to wonder if some of these tests, especially the ones that sent magnetic rays into my brain, might have triggered my ability to sense ghosts, but that’s another blog for later. I quickly swallowed some extra-strength pain relief, heated up my lavender-infused rice pack, and found a quiet spot to rest until it abated. By two o’clock, I was feeling substantially better. I had MJ’s address from earlier in the week, and had even typed it into Google Maps to make sure I knew the general vicinity, but when I plugged it into my GPS, it didn’t recognize it, even though my GPS also uses Google Maps. MJ says this is pretty common for her area and we worked around it, inputting another town that borders on hers. By this time, I was already fifteen minutes late in leaving. All the way to MJ’s house, my ears were ringing. This isn’t usually a good thing. Being clairaudient, I can hear the sound ghosts and spirits make when they move into my space. A clear bell-like tone signifies a spirit, someone who is usually helpful, like a spirit guide or a guardian of sorts. A static sound is the sound a ghost makes, which is something I don’t like to hear, especially after having lived through a horrible ghost attachment several years ago. When I hear the sound, my first reaction is to bolt. Thankfully, this one was a spirit, but it worried me none the less. It almost felt like someone was sending me an urgent plea to turn around and go back home. I didn’t have another situation arise until after I picked MJ up. Even though I knew we would need to travel on Route 2 east to get to Gardner, I started driving west. Maybe it was the lingering effects of the migraine, maybe it was my seasonal allergies acting up, or because MJ and I were chatting. I don’t know, but I drove for ten minutes in the wrong direction before it dawned on me and I turned around. As I’m in route, I got a call from the owner, telling me he’d be late and asked if I could unlock the door for the ghost hunting group who was arriving that night. I readily agreed, until I remembered that I no longer had possession of a key. I called Marion, the caretaker of the mansion, and made a brief detour to Hubbardston to pick up my key. By the time we pulled up at the door, I was twenty minutes late. A car was at the curb waiting for me. A friend of the Victorian’s, who saw my post on Facebook, had wanted to meet me at the house to purchase one of my books. As I was signing books for her and her friend, another car pulled up, asking if I could take them for a tour. This was truly no issue for me. I love giving people tours through the beautiful mansion, watching their faces as they take it all in. By the time we’d finished, the ghost hunting group had arrived, as well as the owner. MJ and I would end up waiting until 10pm before being able to sneak off to do a quick EVP session. A ghost hunting group had booked the mansion for the night. While the house was large enough to support multiple groups, we didn’t want to be in the way. We waited until they took a meal break and then headed to the master bedroom on the second floor. The previous night, Marion and Tina, another of the Victorian’s caretakers, had reported seeing curtains move during the night. I was very impressed, but a little disappointed that nothing of that magnitude has ever happened to me. I’ve collected many evps, but have never actually seen anything paranormal happen there. As I asked for them to move the curtains for me, they complied quickly. A curtain near the fireplace began frantically wiggling back and forth for about fifteen seconds. I tried to debunk it by feeling for a draft, but couldn’t get it to be repeated. Here’s the evp I captured during this time. I sat back down and asked a few more questions. One thing that was on my mind was how the ghosts felt about me. While I thought they generally liked me, I wasn’t sure. So, I asked them if they remembered me. The response was quite shocking. Two of them repeated my name in a five second period. I ended up getting it one more time as well. I still don’t know if they like me or not, but at least I know they’re aware of me. We only had a few minute before the team who was investigating finished with dinner, so we hurried up to the third floor to do one more Spirit Box session. I’ve always gotten great responses there. One man in particular always talks to me. Other known spirits and ghosts on the third floor are a child, and possibly a woman who helped care for the house. I felt someone come into the room. To me, the tone was consistent with a ghost child. Shortly afterwards, I felt a much heavier energy come into the room. It felt dark and intense, not necessarily angry, but not something you wanted to mess with either. The other ghosts tried to warn me he was there. At this point, my ears were ringing with a very high pitch like they had in the car, as though my guardian or spirit guide was trying to get my attention. It was clear she was getting tired of protecting me when I kept putting myself in such imminent danger. I decided to pack up and leave the third floor. We spent a few more hours at the Victorian so I could interview Edwin about his experiences at the house. I’m writing a book for him and wanted to get more details for the next few chapters. We left before midnight and made our way back to the western part of the state. As I drove, I began hearing the signature tone of ghosts in the car with me. I brought something home with me. More than one, as it turned out. If you didn’t think I was crazy before, you might after reading this post. I hung onto this story for well over a month, going back and forth on whether to post it or not. In the end, I decided to share it in hopes that it might help another budding medium. For those who have read my book The Soul Collector, you know that I’ve lived through a very terrifying paranormal experience. The aftermath was fairly predictable. I became afraid of investigating. I only visited places where I thought I’d be safe, and I took protection to heart, sometimes going to great lengths to prevent another ghost from attaching to me. The truth is: ghosts follow me. Being a sensitive, I must just emit a different energy than non-sensitives. Perhaps they think I can help them pass along a message or cross over to the other side, which makes perfect sense. If I possess the ability to sense them, then it would stand to reason that I might be strong enough to help them as well. Unfortunately for them, I’m not to that stage yet. I’m not sure I ever want to get to that stage. After having a very malevolent attachment, I’m afraid of letting anything paranormal get too close to me. Unfortunately for me, they don’t always know this. They follow me anyway. They find me in restaurants, in grocery stores, while driving in my car. I pick them up at my friends’ houses, at doctor’s offices, and while walking my dog through the woods. It all starts with a sound. I hear a tone move through the air, growing louder as it gets closer to me. Sometimes I get a mind picture to go along with it, but sometimes I don’t. No matter what I do or say, they often follow me home. This happened to me in August. I don’t even remember where I picked her up at. I just remember hearing a tone that I identified as a female ghost, and I got a mind picture of a young woman with long dark hair and angry, angry eyes. I did what I usually do in these situations- I ignored her. I’ve tried smudging the house with sage, saying prayers, and firmly telling them to leave. They just laugh at me as they settle in for the long haul. I’ve found, through trial and error, that ignoring them usually makes them go away faster. They grow bored and impatient with me and eventually move onto better targets. This one was different though. It started one Monday morning with the smell of gas. I woke up and made my way to the kitchen, where I planned on making a pot of coffee while surfing the Internet before work. I was stopped short by the overpowering smell of propane gas. It didn’t take long to discover the source. One of the gas burners on my stove was turned on. It was a curious moment for me because I was home alone. In order to turn the burner on, you have to press the button inwards and then turn it. In my eight years in the house, it was something that had never happened to me. My pets lacked opposing thumbs, so I knew they couldn’t have turned it on. I hadn’t cooked anything in days either. I just shrugged and busied myself opening doors and windows to clear out the potentially dangerous fumes. The thought that it might be paranormal never even graced my mind. Two days later, something else would happen to make me question it. I was walking past the bathroom and noticed that the toilet paper roll was missing. The entire silver cylinder was also gone. I looked around in all the rooms, but couldn’t find it. I initially blamed it on the cats. Even though they’d never done this before, it was within reason. I figured I’d find it later under a bed or behind a dresser. What I wasn’t expecting was to find it back in place an hour later. I walked past the bathroom again, on my way to refill my coffee mug, and just happened to glance in the bathroom. I stopped stock-still, just staring at the impossible sight I was seeing. The toilet paper and cylinder were right back in place, as if they were never gone. I took a deep breath and looked around me. I didn’t see anything, but the signature tone I’d been hearing all week was louder than before. Nothing of this magnitude had ever happened to me before. I’ve had the occasional item disappear, only to reappear somewhere else later, but it was never this obvious before. Usually, it would be something I could blame on myself, like finding my keys on the coffee table instead of in my purse where I swore I left them. There was always a possible explanation. This time, there wasn’t one. Toilet paper rolls just don’t simply disappear and then reappear. As I stood there, trying very hard not to allow fear to overcome me, I couldn’t help but wonder. What else was she capable of? If she could move toilet paper, could she also move knives? Could she push me down the stairs or harm one of my pets? It was then that I remembered the gas incident from days before. Was she responsible for that as well? From previous experience, I knew not to allow myself to be afraid. Fear simply feeds them, gives them a deep-dish serving of the energy they need to do more. I probably don’t have to explain how hard this is to do. Fear is our first natural reaction to unsettling incidents. Running and screaming would be the second and third reactions. I took another deep breath and continued down the hallway to refill my coffee, trying not to think too much. Over the course of the next few days, I began feeling her stronger. Her anger was so powerful, it was almost visible, radiating with spiked thorns every time she was near me. I tried to quiet my mind and ask her what she wanted, but all I got was that sense of overwhelming anger. She was either really mad at me, or I reminded her of someone who’d done her wrong at some point. I tried to reason with her, but she just wouldn’t go away. As it turns out, we had a meet-up event at the Haunted Victorian Mansion that weekend. People tease me, telling me it’s become my “home away from home,” which isn’t far from the truth. I am drawn there for reasons I don’t fully understand. But one thing is certain – I always feel very comfortable there. I have a sense that the ghosts at the Victorian like me. They’ve seen me in there dozens upon dozens of times and know that I am one of the Victorian Helpers – someone who comes in to help with events, shovel snow, and visit with the owners. They’ve even seen me lean out the third floor window after a hurricane to pull a piece of loose flashing back into place. I had a small group of mostly newbies that night. 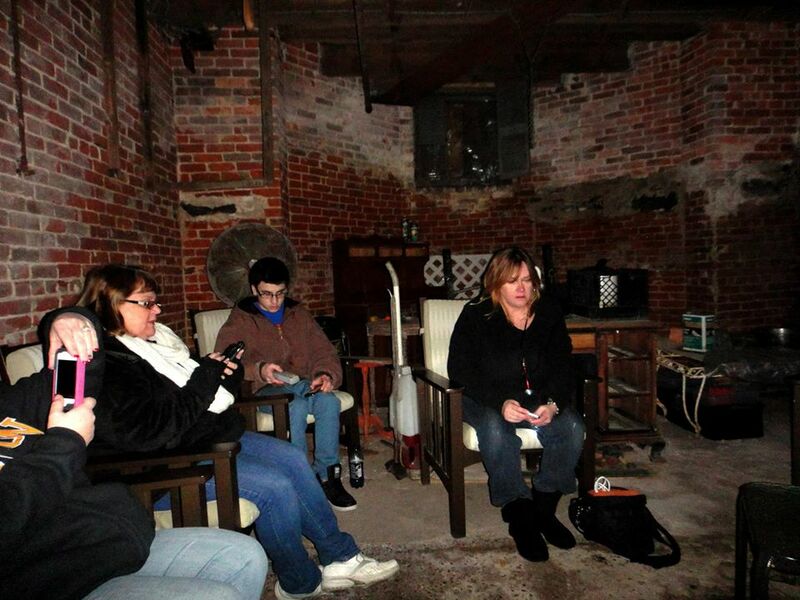 I led many EVP sessions, bringing my group to various rooms in the house. When I got to the Red Room, I did a session, and then waited while everyone packed up and moved to the next room before I spoke to them. “I always feel comfortable here and I get the sense that you like me. I need help though. I have a very negative ghost in my house that might be trying to kill me. Can one of you help me get rid of her?” I asked. I immediately heard a high pitched tone swoop in and settle near me. Through working with a very talented psychic medium, Barbara Williams, I’ve learned that the very high pitched tones aren’t just female, they are spirits. As Barbara explains it, spirits are ghosts who have crossed over like they’re supposed to do. Sometimes they still come to visit, and are even know to help on occasion. They are the grandmother, or mother who passed away, but return for visits. Or they are the spirit guides who travel with each of us. Regardless of what it really was, it was a tone I was comfortable with. I felt nothing but a prevailing sense of peace and love, an invisible hug and a promise that everything would be okay. The moment was so profound for me, I found myself with tears in my eyes. “Thank you,” I whispered into the air. I left a few hours later, having the tone remain with me the entire evening. She was with me when I walked out to my car. She was with me on the thirty-minute drive to my home. I could hear her as I walked up my sidewalk. I could feel her love wash through me. Be strong, she encouraged me. In my mind I saw her as young and blond, dressed in a very plain white dress with an apron. I thought her name was Anna, or Emma, or possibly even Annie. 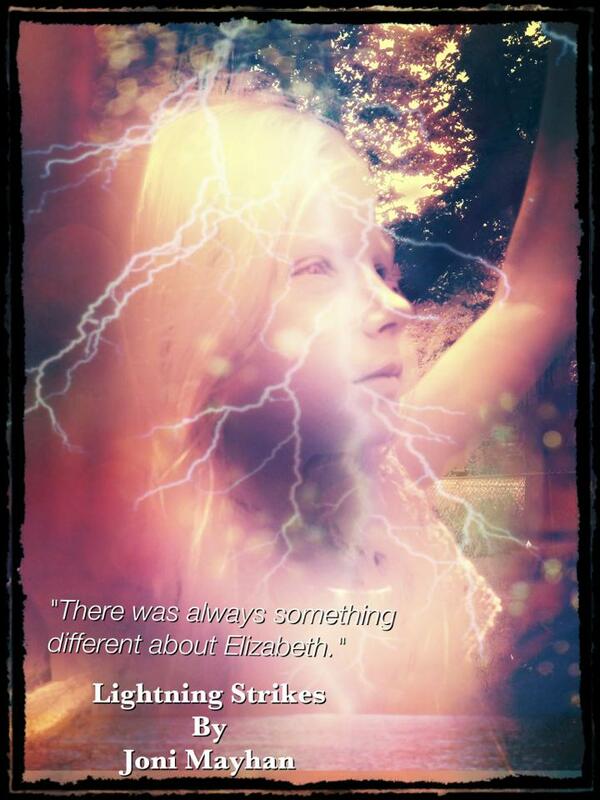 In the end, I called her Emi, after a character in Ember Rain, one of my earlier books. I walked down the dark hallway to my bedroom, trying to still the fear in my heart. My bedroom was always the place where they were the strongest. I seldom slept through the night without being woken up by something. It had gotten so bad that even my cats wouldn’t venture in there any longer, even though it had always been their favorite place to sleep. I quickly dressed for bed and slid under the covers, saying a small prayer before closing my eyes. At first the room was very quiet, then I could hear the negative woman’s lower pitched tone move into the room, almost as though she had a trip-wire alarm set up, alerting her when I was in my room. I pressed my eyes together tightly and began counting down from twenty-one, something I’ve done for years to help me relax enough to fall asleep. Before I got to ten, I could hear Emi’s higher pitched tone whoosh into the room. 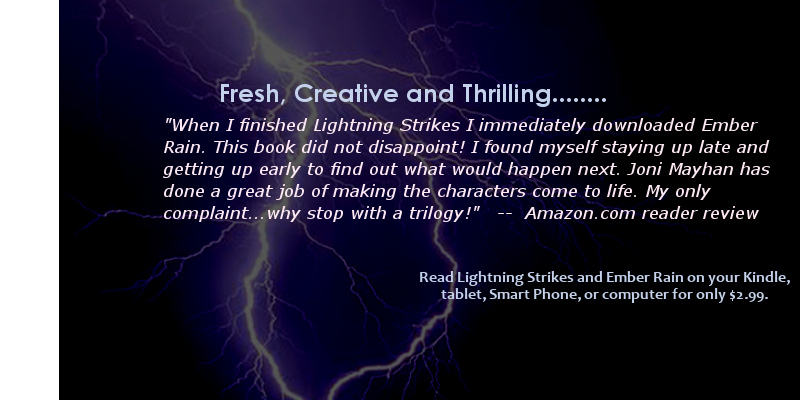 In seconds, the tones began swirling around the room, as though they were chasing one other. The sounds would grow louder, then softer. I opened my eyes, fully expecting to witness a battle, but there was nothing. Just my room. I fell asleep shortly after, somehow. When I woke up the next morning, all I heard was Emi. She’d chased the negative woman away. She stayed with me for several weeks afterwards, almost as if standing guard in case the woman tried to come back. In time, she left completely. I was sad at first, but then realized the valuable lesson she’d taught me. I now know how to protect myself. When I hear the lower static-sound of a ghost or negative entity, I reach out with my mind and ask for help. Soon, I hear the faint sound of a high-pitch, growing louder and louder as she moves closer. Within moments, the lower-pitched tone disappears, and I feel the warmth and love from my guardian. I don’t know if it’s Emi or someone else who is watching over me. All I know is that my faith in love and spiritual intervention is stronger than it’s ever been. For every negative entity, there is a positive one who will come to my rescue. I know this is a bizarre story. I know it’s difficult to believe. If someone told it to me, I’d probably arch an eyebrow, wanting to check their medicine cabinet later, but I can assure you that I am completely sane and always have been. Strange things just seem to happen to me and I often share them with the world. Maybe it’s my gift, my destiny. Angels of Ember trilogy – After a devastating virus nearly wipes the world clean of people, 16 year-old Ember Pain grows tired of running and hiding. Fighting back becomes not only a necessity, it becomes a battle of good over evil. The first time I heard the term “Paranormal Unity” I had mixed feelings. First, I thought back to my Girl Scout days, when we’d sit around a camp fire singing Kumbaya, feeling a togetherness I haven’t felt since. We promised to always have one another’s backs and help each other succeed in the world. I saw us as this unstoppable force that could change the world. I imagined the paranormal world embracing this attitude; sharing information and helping us understand the unknown a little better. This could never happen in the paranormal community, mostly because we aren’t a community at all. We are nothing but a bunch of islands scattered in a vast sea. Some of us play well with others, reaching out to various teams for support and to share ideas, but most of us don’t. There is more bickering between the teams than ever before. I’m not sure I even got into the field for the right reasons. So many people claim they investigate because they want to help people or help ghosts find their way to where they’re supposed to be. I got into it because I was curious. It’s as simple as that. I had several experiences that I couldn’t explain and I wanted to know more. Once I dipped my foot into that ocean, I was hooked. I wanted to know more and more and more. If I helped people or ghosts along the way, that was even better. Now I’m reconsidering this field. You can’t go on Facebook without seeing someone bashing someone else over how they investigate, or whether a house was even haunted. People open their homes or businesses up for investigations and other people get on social media or radio shows, telling the world they are frauds or thieves, or whatever strikes their fancy. I find myself defending people – defending my friends. And then I find myself under attack for standing up for my friends. Seriously? I had a very bad experience two years ago that truly scared me. It made me question everything I’d ever heard about ghosts. It made me believe in demons and angels and spirit guides, things I would have rolled my eyes at a decade ago. It was a very humbling experience for me. It made me realize that everything isn’t always as it seems. And that bad things can and will happen, even when you’re as careful as you can be. It makes me understand why a homeowner could flee their house, but still love the house enough to not want to give it up. In the aftermath of my own experience, I’m still strangely curious about the paranormal. I still go on the occasional investigation if it intrigues me. I try to keep myself protected and I only go to places where I think it’s safe. I don’t go to old prisons or old TB hospitals any longer. I don’t go to cemeteries, because who knows what you’re going to find there? I’ve gotten some flak over it. While most people understand, others will try to discredit my story, telling me that someone who went through what I endured would never willingly step foot in a haunted location again. I don’t know what to tell these people except that it did happen and I am still intrigued. I’m just more careful now. When I do go on investigations, I try to help out as best as I can, knowing the most I can do is collect data. I’m not certain how much this helps anyone. Is knowing really better? Are psychic mediums the only ones who can help trapped entities? Is that even possible? I’ve been told there is no such thing as trapped ghosts. I’ve been told that ghosts are literally everywhere, but don’t usually bother people unless they are upset. I’ve been told things that directly conflict with other things I’ve been told. And every single person who told me these things held firm in their convictions that they were right and the naysayers were wrong. So, who’s right? Honestly, nobody knows for sure. I’m sorry. I don’t care who you are and what you do; you can’t truly know these things until they happen to you. There might be a light we all go to. There might not be. There might be a demon in the basement. There might not be. There might not even be such a thing as demons. Who knows? All we do know is that something happens to us when we die because we’ve collected enough evidence supporting this. The best thing to do would be to make it a group effort, pooling our resources. And stop hurting each other. Paranormal Unity and a dollar will buy you a cup of coffee. That’s about all. While I love the concept, it just will never work in this field. You just have to find people who you enjoy spending time with, and who won’t hate on you the moment you turn your back, and just do what you do. Or maybe we should just all leave well enough alone. We could all be doing more harm than good, despite our best intentions. When it comes right down to it, the only ones we’re truly hurting with our negativity is ourselves and our field. The more we bicker, the more we discredit everything we’ve collectively done. We tear down each other’s evidence, we point fingers, we say snide things when we don’t agree with what we’ve heard. And through that, we make ourselves look foolish. We make people outside our field scratch their heads, wondering if we’re all just a little crazy. I’m not going to say anything bad about anyone else. People come to the place they are because they’ve lived through things that shaped them that way. I’m not perfect either. I just try to stay away from the bullies and find the people like me, who just want to learn more. And I write books about it, because that’s what I do. I will go on to protect my friends, because that’s also what I do. I’ll help people who need my help, if it’s something I’m capable of helping with. I’ll tread lightly, trying not to do more harm than good. But just know, that inside when I hear you talking badly about one another, I will shake my head sadly. We’re all people, having a human experience. We should help one another, at least a little. And we should stop all the hating. It doesn’t help anyone. Angels of Ember trilogy – in this post-apocalyptic thriller, follow sixteen year-old Ember Pain as she fights for survival in a world that has become dark and deadly, fighting against all odds to prove that good truly does conquer evil.